Made progress on several fronts. 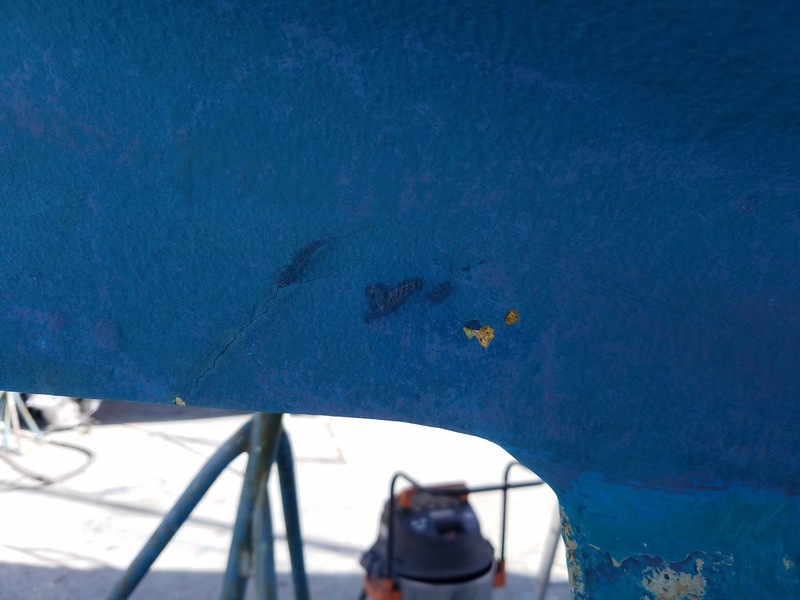 We started the Sanding of the below water line paint, found several hundred tiny blisters, most less than the size of a pinky fingernail. They should just sand out and get painted. 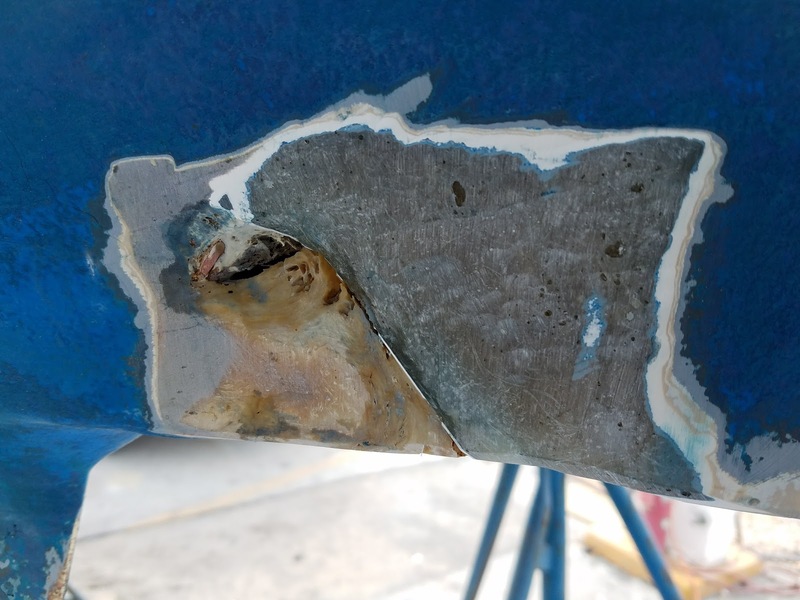 Biggest issue was finding a crack above and just forward of the cutlass bearing support, the crack appears on both sides of the skeg but I think it's easily solved. Plan is to grind away the area each side of the crack, and layer in several stranded glass sheets with epoxy resin before priming and painting. Here's the Port Side of the crack with the surrounding area ground away. There's signs of an earlier repair (that white strip from the underside of the skeg up along the crack. There are voids where the area was not filled correctly, could have been during manufacture, but the crack looks very recent. Here's a view from underneath. The crack is clearly visible and the voids also. Plan is still the same, fill the voids with epoxy resin, then build up the surface with glass fiber cloth spanning the crack. I dug in a bit further to make it easier to fill the voids. I used the West System epoxy and really forced the resin inside the open crack and into the voids. Voids filled as best I could, I then ground away the excess resin & filler so that I could layup the glass fiber. Once ground down, I cleaned the area again with dewaxer and then layed up 6 layers of glass cloth. That pretty well brought the surface close to the normal surface level. I used my glass roller to squish out any air bubbles in the glass cloth/resin. 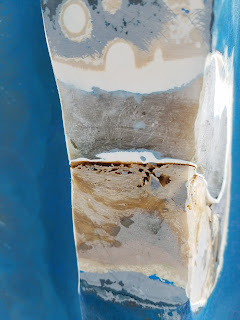 Once the resin was set, I sanded again to smooth out the area, then cleaned and applied some more filler to bring the surface back to it's correct profile. The glass cloth and resin spanned the crack on both the sides and underside. 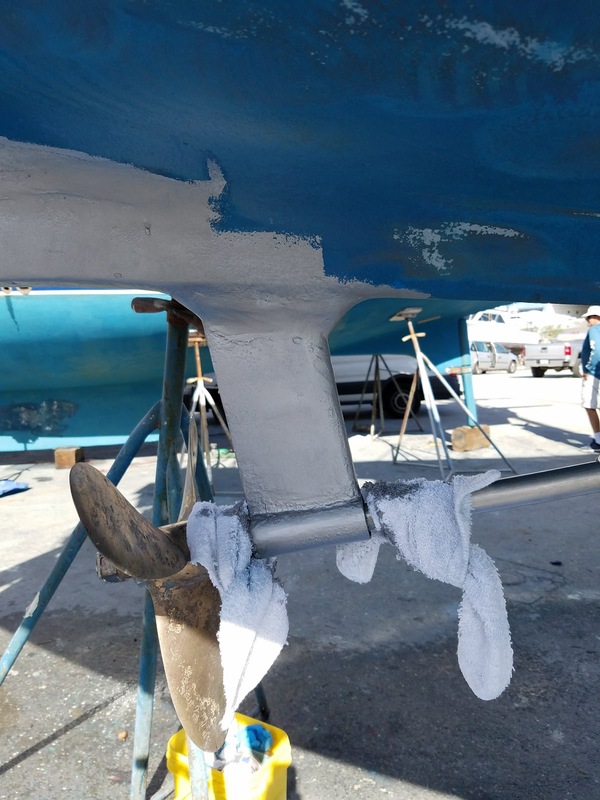 Primed and ready for AntiFouling paint. 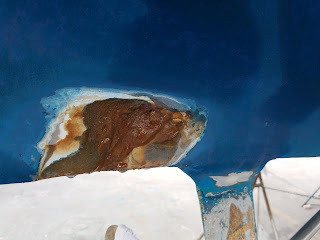 Notice that I tied terry cloth towels around both ends of the cutlass bearing and kept them in place during all of the sanding and painting, I just did not want to get any dust, resin drips or paint onto the ends of the cutlass bearing. Hull blisters opened, dried, sealed, faired, and primed. 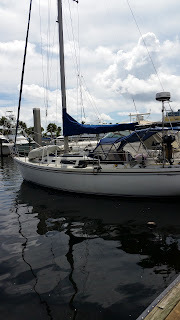 Rebuild the Rudder control steering quadrant and setup Rudder & Wheel for correct Center.